Explore the vast land of central Alaska on a Vertical Solutions Helicopter tour. Offering a variety of experiences from 30-minutes to 2-hours and 20-minutes. The Glacier Explorer is a 60-minute tour that provides photo/video opportunities in the air as well as adventure on the ground. 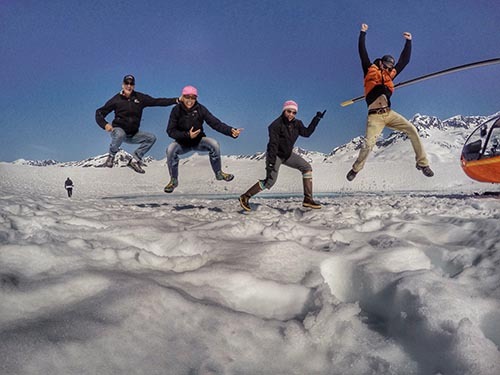 After touring the Alaskan landscape and looking for wildlife by air, your pilot will find the perfect place to land on top of a glacier so you can get out, drink glacier water, throw rocks in a moulin and explore. The Glacier Explorer Deluxe is a 1-hour and 30-minute tour with all the Glacier Explorer tour and more! See Alaska by air, explore a glacier on foot, and fly by the second largest tide water glacier in Alaska. Look for seals resting on floating icebergs and goats perched on sheer mountain cliffs. The Columbia Glacier is the fastest receding tide water glacier in Alaska. Because of its massive size and incredible crevices, you’ll most likely see huge chunks of ice calving off into the ocean. The Columbia Glacier Iceberg Landing is a 1-hour and 45-minute tour with time in the air to experience the great Alaska landscape, as well as time on the ground to explore on foot. Your pilot will land at the face of Alaska’s second largest tide water glacier, the Columbia Glacier, so you can get out of the helicopter and explore what the ocean leaves behind after the tide goes out – huge glacier ice chunks! Exploring this beach-like spot provides great opportunity for photo and video, walking among the glacier ice mountains, or taking in the sounds of ice movement, which can sometimes resemble rolling thunder. A majestic experience at the fastest receding tide water glacier in all of Alaska, one of our pilot’s favorite tours. The Everything & the Kitchen Sink is a tour that has it all – everything from all of our other tours rolled into one. This 2-hour and 20-minute tour has two glacier landings. You can drink glacier water, see seals resting on floating icebergs, goats perched on sheer cliffs and calving events and massive crevices of the Columbia Glacier, hear the amazing thunderous sounds of ice movement and explore mountain lakes, glacier moulins and glacier ice mountains stranded on the beach. One package with it all; it’s sure to be on everyone’s bucket list. 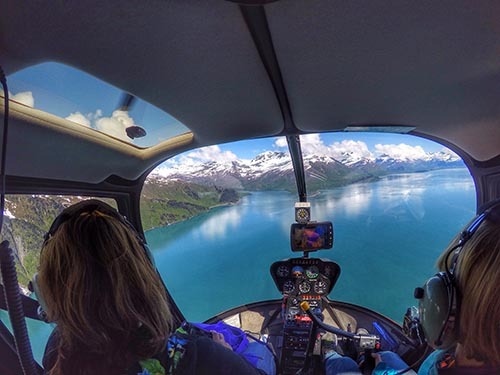 Immerse yourself in the breathtaking views of Alaska from a helicopter. You’ll see wildlife, icebergs, mountains and waterfalls. Take off! Walk on a glacier. 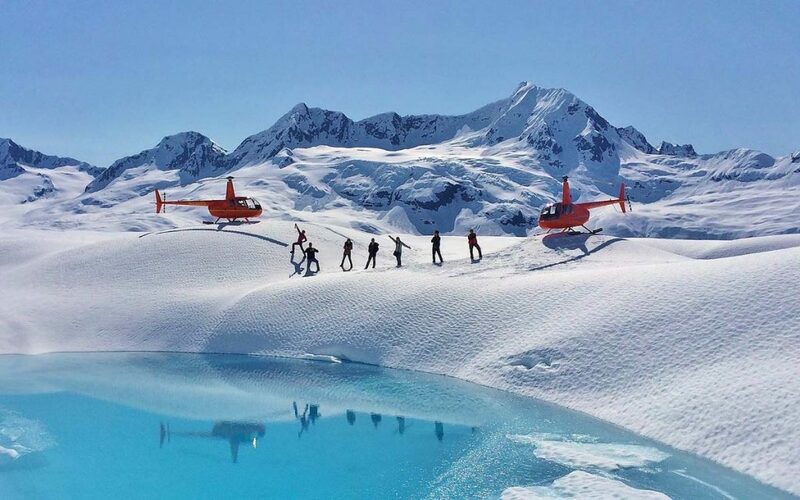 They also offer a Heli Yoga Charter to become one with the countryside and connect with nature while listening to the sound of glacier ice, wind, and water (soundtrack). Traveling to Alaska and experiencing the beauty of this wild landscape is a life changing experience. 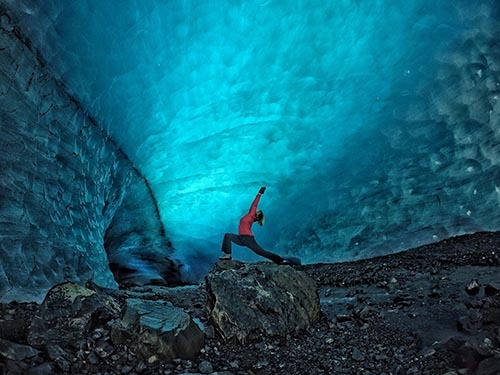 Bring your warm yoga gear and they’ll take you to some of the most spiritual places around the Prince William Sound. Vertical Solutions (VS) Helicopters, LLC is a locally owned and operated helicopter service company in Valdez, Alaska who has established a reputation for personal service and safety. It’s operated by long-time Alaskan pilots who are passionate about what they do, and where they are from. Let them create the flight of a lifetime for you. This is cool, share it!